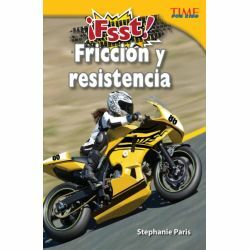 In this stimulating, Spanish-translated nonfiction book, readers will discover the various types of friction--including rolling friction, sliding friction, fluid friction, and static friction--and the huge impacts it has on nature, machines, and our lives. In addition, readers are encouraged to perform basic experiments to assist in the understanding of friction, kinetic energy, and water resistance. With real-life examples, colorful images, accommodating graphs and charts, and informational text, children will be inspired and engaged as they move through this book.